Definition: The Entrepreneur is a change agent that acts as an industrialist and undertakes the risk associated with forming the business for commercial use. An entrepreneur has an unusual foresight to identify the potential demand for the goods and services. The entrepreneurship is a continuous process that needs to be followed by an entrepreneur to plan and launch the new ventures more efficiently. Discovery: An entrepreneurial process begins with the idea generation, wherein the entrepreneur identifies and evaluates the business opportunities. The identification and the evaluation of opportunities is a difficult task; an entrepreneur seeks inputs from all the persons including employees, consumers, channel partners, technical people, etc. to reach to an optimum business opportunity. Once the opportunity has been decided upon, the next step is to evaluate it. An entrepreneur can evaluate the efficiency of an opportunity by continuously asking certain questions to himself, such as, whether the opportunity is worth investing in, is it sufficiently attractive, are the proposed solutions feasible, is there any competitive advantage, what are the risk associated with it. Above all, an entrepreneur must analyze his personal skills and hobbies, whether these coincides with the entrepreneurial goals or not. Developing a Business Plan: Once the opportunity is identified, an entrepreneur needs to create a comprehensive business plan. A business plan is critical to the success of any new venture since it acts as a benchmark and the evaluation criteria to see if the organization is moving towards its set goals. 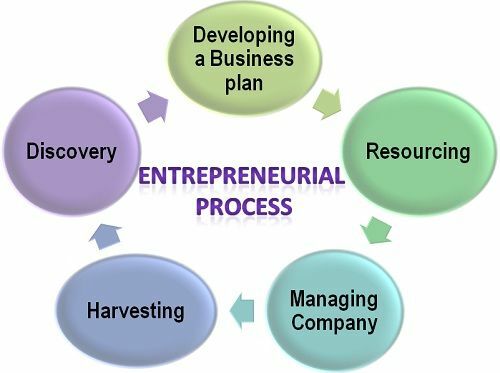 An entrepreneur must dedicate his sufficient time towards its creation, the major components of a business plan are mission and vision statement, goals and objectives, capital requirement, a description of products and services, etc. Resourcing: The third step in the entrepreneurial process is resourcing, wherein the entrepreneur identifies the sources from where the finance and the human resource can be arranged. Here, the entrepreneur finds the investors for its new venture and the personnel to carry out the business activities. Managing the company: Once the funds are raised and the employees are hired, the next step is to initiate the business operations to achieve the set goals. First of all, an entrepreneur must decide the management structure or the hierarchy that is required to solve the operational problems when they arise. Harvesting: The final step in the entrepreneurial process is harvesting wherein, an entrepreneur decides on the future prospects of the business, i.e. its growth and development. Here, the actual growth is compared against the planned growth and then the decision regarding the stability or the expansion of business operations is undertaken accordingly, by an entrepreneur. The entrepreneurial process is to be followed, again and again, whenever any new venture is taken up by an entrepreneur, therefore, its an ever ending process. Thanks, this really helps for my studies! Thanks for sharing this with very clear steps. It will certainly help when starting my business.